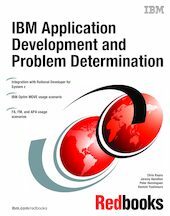 The Problem Determination toolset, or PD Tools for short, consists of a core group of IBM® products designed to work in conjunction with compilers and run times to provide a start-to-finish development solution for the IT professional. This IBM Redbooks® publication can provide you with an introduction to the tools, guidance for program preparation for use with them, an overview of their integration, and several scenarios for their use. When developing a system, an iterative process is usually employed. You can decide to create a starting set of test data using Optim MOVE to strip or modify existing databases, files, and data relationships. File Manager can also scramble, alter, or otherwise process this data. Once created, this data can be used to test the newly developed or maintained software. Should an abend during testing occur, Fault Analyzer enables the programmer to quickly and easily pinpoint the abending location and optionally, the failing line of code. Many times, this is all the programmer requires to correct the problem. But occasionally, it might be necessary to delve a little deeper into the code to figure out the problem. Debug Tool allows the programmer to step through the code at whatever level is required to determine where the error was introduced or encountered. After the code or data is corrected, the same process is followed again until no errors are encountered. But, this is not the whole story. Volume testing or testing with multiple terminals is sometimes required to ensure real-world reliability. Workload Simulator can be utilized to perform this type of testing. After all tests have been completed, running the application using Application Performance Analyzer will ensure that no performance bottlenecks are encountered. It also provides a baseline to ensure that future enhancements do not introduce new performance degradation into the application.